ALFERIUS, (ALPHERIUS, ADALFERICUS), born in Salerno in Campania (south-western Italy) to the noble Pappacarbone family. Following a serious illness, St. Alferius went to Burgundy (France) where he received monastic tonsure at the Abbey of SS. Peter and Paul of Cluny (abbaye Saint-Pierre et Saint-Paul de Cluny — Cluny Abbey) in Burgundy (France), where he was a disciple of St. Odilo (11th May). He was recalled by the Duke of Salerno to undertake reforming the monasteries in the Duchy. St. Alferius met with little success and retired to Mt. Fenestra near Salerno, to live as a hermit. As his reputation for holiness of life and wisdom spread, St. Alferius attracted many disciples. Having selected twelve of them, he built the Abbey of the Holy Trinity of La Cava (Abbatia Sanctissimae Trinitatis Cavensis). St. Alferius served as Abbot until the age of 120 years, when he reposed on Holy (Maundy) Thursday 1050, after celebrating the liturgy and washing the feet of his monks. CONSTANTINE, the first Bishop of Gap, in Province (France). All that is known about St. Constantine is that he was an attendee at, and signatory of the Canons of, the Councils of Epaone (517) and Orange (519), and that he reposed in 529. DAMIAN, elected Bishop of Pavia in Lombardy (Italy) in 680, St. Damian was a staunch opponent of Monothelitism, and successfully negotiated peace between the Byzantine Emperor and the Lombards. St. Damian is said to have healed a leper with a kiss. He reposed in 710. ERKEMBODEN (ERKEMBODE), nothing certain is known about St. Erkemboden’s early life. The consensus is that he was an Irishman who went to France to work as a missionary. Some sources state he was accompanied by two companions who were murdered along the way. Regardless, St. Erkemboden settled at the Abbey of St. Peter the Apostle / Saint-Pierre l'apôtre (later the Abbey of St. Bertin of Saint-Omer / abbaye Saint-Bertin de Saint-Omer) in Sithiu (later Saint-Omer) in Pas-de-Calais (France). There he received monastic tonsure and became a disciple of St. Bertin (5th September). Following St. Bertin’s resignation, St. Erkemboden was elected Abbot, and then Bishop of Thérouanne (Pas-de-Calais, France). He served as Abbot and Bishop for twenty-six years, reposing in 714. JULIUS I, elected thirty-fifth Pope of Rome in 337, he fought Arianism, and defended St. Athanasius the Great throughout his persecutions, and was responsible for the building of several churches in Rome. St. Julius reposed in 352. TETRICUS, an Abbot of the Abbey of St. Germanus of Auxerre (abbaye Saint-Germain d'Auxerre) in Auxerre in Burgundy (France) who became Bishop of Auxerre by popular acclamation. St. Tetricus was murdered by his Archdeacon in his sleep in 707. VICTOR, a catechumen martyred circa 300 in Braga in Portugal during the Diocletianic Persecution. VISSIA, a consecrated virgin martyred circa 250 at Fermo near Ancona during the Decian Persecution. WIGBERT, an Englishman, went to Ireland and became a disciple of St. Egbert (24th April) at Rathelmigisi in Connaught (Ireland). St. Wigbert then spent two years in Friesland (northern Netherlands) working to enlighten the Friesians, and returned to Ireland, where he lived until his repose in 690. ZENO, a native of North Africa, St. Zeno was consecrated Bishop of Verona in the Veneto region of Italy in 362. 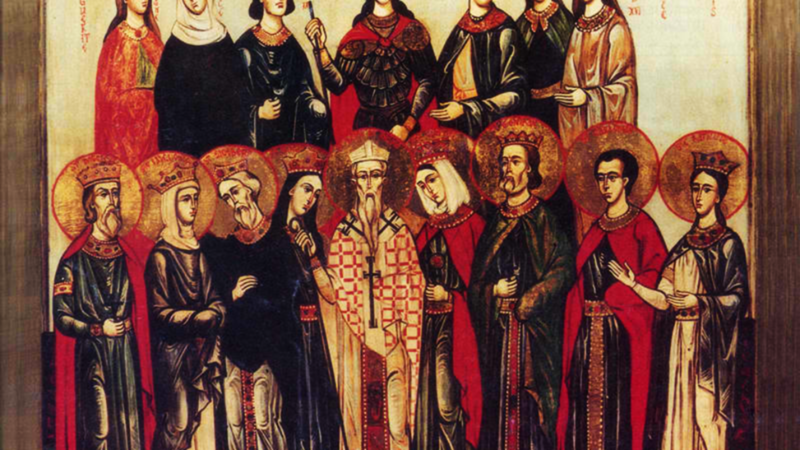 A fierce opponent of Arianism, St. Zeno welcomed a great number of refugees from the Arian persecutions in North Africa. St. Zeno reposed in 371.